Two of Ulster`s top up and coming Under 23 riders have made it in to the National squad for the UCI 2.2-ranked Kreiz-Breizh Elites race this weekend in France. Mark Downey, Matty Teggart, Mark Dowling, Darragh O’Mahony, Conor Hennebry and Sean McKenna make up the squad for the 3-day, four-stage event which gets underway in Brittany on Saturday and will see a total of 28 teams and 168 riders from all over Europe taking part. There are just two changes from last year’s team, which saw Dowling the star of the National squad, with O’Mahony and Hennebry getting the call-up following three wins in less than two weeks in Belgium. Downey and Teggart are based in France this year, and Downey`s recent Silver medal in the European Under 23 Points Race Championship points’ race sees him continue a great 2016 season. Stage one on Saturday morning is will see the field tackle 194 kilometres from Calanhel to Plouray. 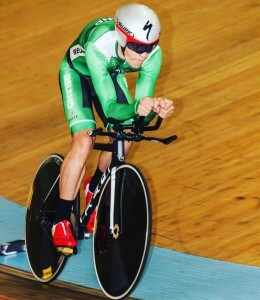 L. Dromore`s Mark Downey at the recent European Under 23 Track Championships in Italy, where he picked up a Silver medal in the Points event.